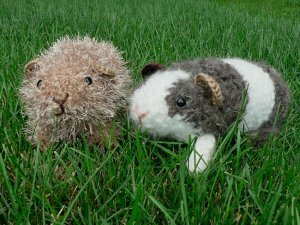 An original realistic crochet amigurumi Guinea Pig pattern from the Fuzzy Friends collection by June Gilbank. Details: The pattern includes full instructions to make single-colour or dual-colour guinea pigs and long haired or short haired guinea pigs! Date Added: 12/05/2012 by Nicole D.
Date Added: 05/24/2011 by channing l.
Date Added: 02/04/2011 by Katalin G.
Date Added: 09/30/2010 by Christina F.
Date Added: 08/13/2010 by Amy A.